Building a new home is fine but making it look nice and homely involves a lot of interior decoration. A home without any decoration looks almost like a bride without a bridal wear. It’s the touch of decoration that brings life to the empty walls and corners of the house. In recent days creating artistic interior look with picture frames has been in trend. Check out below for some great new ideas to transfer your home walls all new and beautiful by using frames. Paint the frames leaving the inside empty: If you are tired of the old frames in your room, simply take it out and colour them with acrylic colours of your choice, and give them all new look. Group and place the coloured frames on the wall. Transform frame into a chalk board: Transfer those old frame pieces into a chalk board. Behind the neat designed frame mount a chalk board. Place the board in front the entrance of your room and write some positive quotes in it to remind you of living a positive life daily. You can place it in your kid’s room, in your office cabins, kitchen, etc. Make a Mirror out of Beautiful Frames: Those beautiful classic frames can simply give a complete new outlook to your living area or cosy bathroom after transferring it into a beautiful mirror piece. 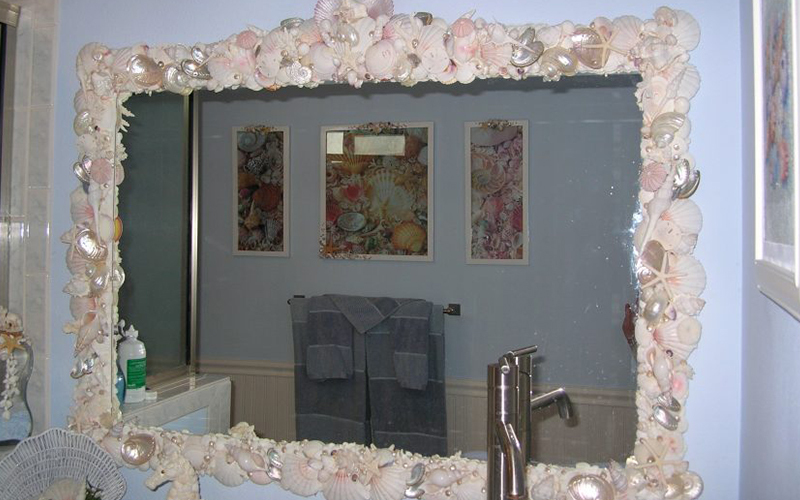 Place the re-farmed mirror in front of your sink vanity or at the side walls of your living room passage. Mirrors always add extra dimension to the interior look. Frames to hang jewelleries: Another astounding idea about making your frame looking new and useful is turning into a jewellery hanging piece. To make it jewellery hanging set just add a board screen behind it and earrings can be stuck making holes on the screen. Display your jewelleries in it. It both makes room for your messily kept jewellery pieces and colourful jewellery sets add a stunning colourful look to the empty boring wall. Place a Vase into the frames for Cosy artistic Look: Are you thinking what to do with the giant frames and where to put them? Well place it at the empty wall of your living area and put a flower vase inside it making it look like a vase holder. Your pretty vase and the giant both get and beautifully notice all over again. Border your Fire place with a Frame: What about bordering the square empty fire place with the frames and giving it a new cosy looks? Frame the empty wall of the fire are with frame to give it a brand new artistic reflection to your interior decorating style. Decorate Frames to make it a Stunning Wall Hanging: If you are fond of art & crafts and love make wall hangings then why not transforming the picture frames into a great wall hanging? Take any frame shape and size of your choice and decorate it with cool stuff like; beads, paper flowers, strings, glitters, etc. Make a new wall hanging set and hang them on the wall. Display Geometric objects inside Frames instead of Pics: You don’t always need to put pictures inside those picture frames, just because it is meant for it. You can re create the looks by adding various neat geometric shapes matching them with the colour of your walls and place it on the walls. They look neat and tidy. Transform Frames into Colourful Wall Calendars: No more buying of calendars. Time for new cool stuff. Make colourful weekly calendars out of those picture frames. Isn’t a cool idea? Stun your visitors by those cool DIY home made calendars in the frame. Use Frames as Key Holders: Keys are something that we always tend to lose. Those bunch of keys plays hide and seek with us all the time and freak us out in times of urgent need. Why not make use of one of those picture frames into key holders. It looks cool and serves well too. Never again you have to spend hours searching for key all around your house. Just place the frame in some convenient area and hang the bunch of keys in it. These are some of the ideas to help you recreate all new look using picture that are either lying in your store room or planning to buy frames but cannot think of any new idea to create something out of the box. Here are some cool ideas that will surely help you in decorating your house with picture frames in all new way you could possibly think.